This article is about the tribe known in Latin as the Teutones. The term "Teutons" also may refer to the Germanic peoples collectively or the Germans in particular. It also may be used a shorthand for the Teutonic Knights. The migrations of the Teutons and the Cimbri. L defeats of the Cimbri and Teutones. 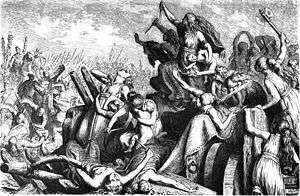 The Teutons (Latin: Teutones, Teutoni) were a Germanic tribe or Celtic tribe mentioned by Greek and Roman authors, notably Strabo and Marcus Velleius Paterculus. According to a map by Ptolemy, they originally lived in Jutland, which is in agreement with Pomponius Mela, who placed them in Scandinavia (Codanonia), although there was disagreement by these scholars whether or not they were related to the Celts. Rather than relating directly to this tribe, the broad term, Teutonic peoples or Teuton in particular, is used now to identify members of a people speaking languages of the Germanic branch of the Indo-European language family. 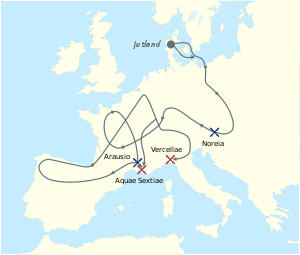 In the late second century BC, many of the Teutones, under their leader Teutobod as well as the Cimbri, migrated from their original homes in southern Scandinavia and on the Jutland peninsula of Denmark, south and west to the Danube valley, where they encountered the expanding Roman Republic. 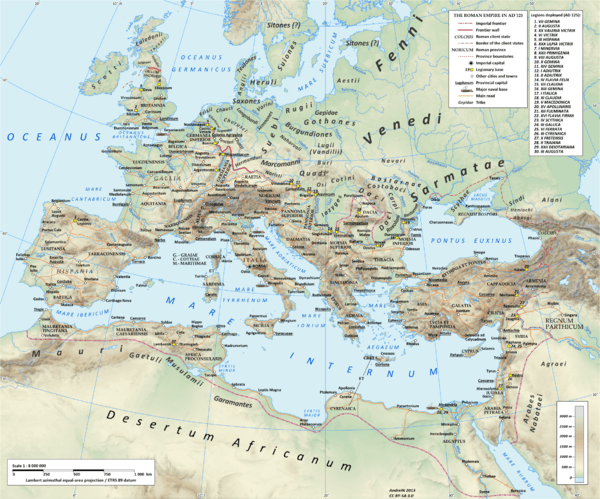 The Teutones and Cimbri were recorded as passing west through Gaul before attacking Roman Italy. After decisive victories over the Romans at Noreia and Arausio in 105 BC, the Cimbri and Teutones divided forces and were then defeated separately by Gaius Marius in 102 BC and 101 BC respectively, ending the Cimbrian War. The defeat of the Teutones occurred at the Battle of Aquae Sextiae (near present-day Aix-en-Provence). Some of the surviving captives were reported to have been among the rebelling Gladiators in the Third Servile War. The linguistic affinities of the Teutones are a matter of dispute amongst historians. Their name is Celtic in form and many writers believe that the Teutones really were Celts, however, a people of this name are mentioned by the early traveller, Pytheas, as inhabitants of the northern ocean coasts. Strabo and Marcus Velleius Paterculus, moreover, classify them as Germanic peoples, and this is perhaps a more probable view, although the distinction between Celts and Teutones is not clearly realized by some earlier historians. If the Teutones really came from the same quarter as the Cimbri, it is possible that their name may have been preserved in the Thyland or Thythsyssel regions, found in the far north-west of Jutland. According to the writings of Valerius Maximus and Florus, the king of the Teutones, Teutobod, was taken in irons after the Teutones were defeated by the Romans. Under the conditions of the surrender, three hundred married women were to be handed over as Roman slaves. When the matrons of the Teutones heard of this stipulation, they begged the consul that they might instead be allowed to minister in the temples of Ceres and Venus. When their request was denied, the Teutonic women slew their own children. The next morning, all the women were found dead in each other's arms, having strangled each other during the night. This act passed into Roman legends of Teutonic fury. 1 2 Waldman, Carl; Mason, Catherine (2006). "Teutons". Encyclopedia of European Peoples. Infobase Publishing. pp. 797–798. ISBN 1438129181. Retrieved May 25, 2013. ↑ Strauss, Barry (2009). The Spartacus War. Simon and Schuster. pp. 21–22. ISBN 1-4165-3205-6. 1 2 3 4 Chisholm 1911, p. 673. Fick, August, Alf Torp and Hjalmar Falk: Vergleichendes Wörterbuch der Indogermanischen Sprachen. Part 3, Wortschatz der Germanischen Spracheinheit. 4. Aufl. (Göttingen: Vandenhoeck and Ruprecht), 1909. This article incorporates text from a publication now in the public domain: Chisholm, Hugh, ed. (1911). "Teutoni". Encyclopædia Britannica. 26 (11th ed.). Cambridge University Press. p. 673. Wikimedia Commons has media related to Teutons. Beach, Chandler B., ed. (1914). "Teutones". The New Student's Reference Work. Chicago: F. E. Compton and Co.